Participants : A. Kibangou, A.L.F. de Almeida [Univ. Federal do Ceara] . As explained before, multiple access protocols such as Time Division Multiple Access (TDMA) can induce a latency that can be damaging for control purposes. In this case, Direct-Sequence Code Division Multiple Access (DS-CDMA) is certainly well indicated. In the last decade, by exploiting several diversities, new signal processing techniques based on tensor modeling have been developed. With a very high efficiency, they allow the blind estimation of transmitted information sequences  ,  ,  ,  . In general, these works are devoted to communication systems with an antenna array at the receiver. However, many wireless devices are limited by size, hardware complexity or other constraints to a single antenna. The powerful tensor based methods cannot be applied for such nodes. By resorting to the idea of collaborative signal processing, we have shown how estimating the channel, symbols, and codes in a distributed way when each node in the network has a single antenna. The received data samples can be stored in a three-way array, or a third-order tensor, admitting a PARAFAC model. 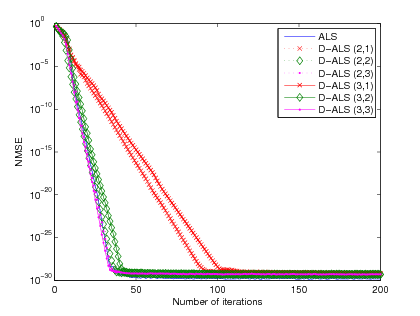 In general, the parameters of the PARAFAC model are estimated using an Alternating Least Squares (ALS) algorithm. We have derived a distributed version of ALS where finite number of average consensus iterations are run between consecutive ALS iterations  . Some simulation results are depicted in Figs. 8 and 9 where we denoted by D-ALS(i ,j ), the D-ALS corresponding to the i th topology of connection with j consensus iterations. In Fig. 8 , the NMSE is plotted as a function of the number of iterations. It can be seen that the connection topology impacts the convergence of the D-ALS algorithm. Connection topologies with greater connectivity degree have convergence properties (speed and final value) similar to those obtained with ALS. Figure 8. Median NMSE for Q = 3 and three consensus iterations. In Fig. 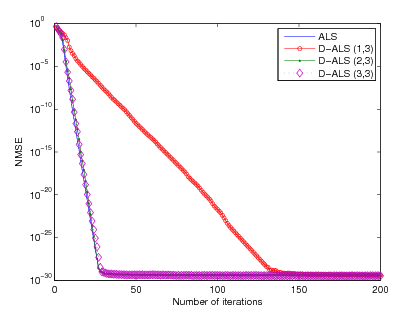 9 , we note that even for a single consensus iteration the D-ALS algorithm converges towards the same value than ALS. However, the convergence speed is lower. It can be accelerated by increasing the number of consensus iterations. Figure 9. Median NMSE for Q = 4 and different number of consensus iterations. Participants : F. Garin [contact person] , S. Zampieri [Univ. di Padova] , E. Lovisari [Univ. di Padova] . where vector x(t) has N entries corresponding to the current state of the agents, and P is a doubly-stochastic matrix. Traditional analysis of linear average-consensus algorithms studies, for a given communication graph, the convergence rate, given by the essential spectral radius of the transition matrix (i.e., the second largest eigenvalues modulus). For many graph families, such analysis predicts a performance which degrades when the number of agents grows, basically because spreading information across a larger graph requires a longer time. However, if you consider other well-known quadratic performance indices (involving all the eigenvalues of the transition matrix), the scaling law with respect to the number of agents can be different. This is consistent with the fact that, in many applications, for example in estimation problems, it is natural to expect that a larger number of cooperating agents has a positive, not a negative effect on performance. It is natural to use a different performance measure when the algorithm is used for different purposes, e.g., within a distributed estimation or control algorithm. Examples of various relevant costs can be found in the book chapter  and in the references therein. We are interested in evaluating the effect of the topology of the communication graph on performance, in particular for large-scale graphs. Motivated by the study of wireless sensor networks, our main objective is to understand the limitations which arise when agents are limited to truly local interactions, i.e., the neighbourhoods are determined by being `near' in a geometric (Euclidean) way, differently from graphs with few but possibly `distant' connections, such as in small world models. Our aim is to prove that such a behaviour depends on the locality of interactions, not on the symmetries. To do so, we exploit a powerful tool, the analogy between reversible Markov chains and resistive electrical networks  . The main result is to recognize that the LQ cost is equal to the average effective resistance on a suitably defined networks of resistors. Then, we exploit the monotony of all effective resistances in the network with respect to variations of the resistance of single resistors, so that we obtain bounds on the cost for some quite irregular graphs, with respect to the known behaviour for the regular lattice. This work is described in  and  . Participants : A. Seuret [Contact person] , G. Rodrigues de Campos, D.V. Dimarogonas [MIT] , K.H. Johansson [KTH] . Another effort has been devoted to the problem of controlling a set of agents cooperating under communication constraints. We consider a “consensus” algorithm as an interaction rule that specifies the information exchange between an agent and all of its neighbors over the network in order to reach an agreement regarding a certain quantity of interest that depends on the state of all agents. However, the use of a shared network introduces new challenges, such as delays over communications, packet losses or even communication blackout, witch can dramatically affect “consensus" convergence rate and cooperative control laws efficiency. where U2 is a vector depending on the communication graph. Then, based on Lyapunov-Krasovskii techniques and LMI representation, an estimate of the convergence rate is provided. 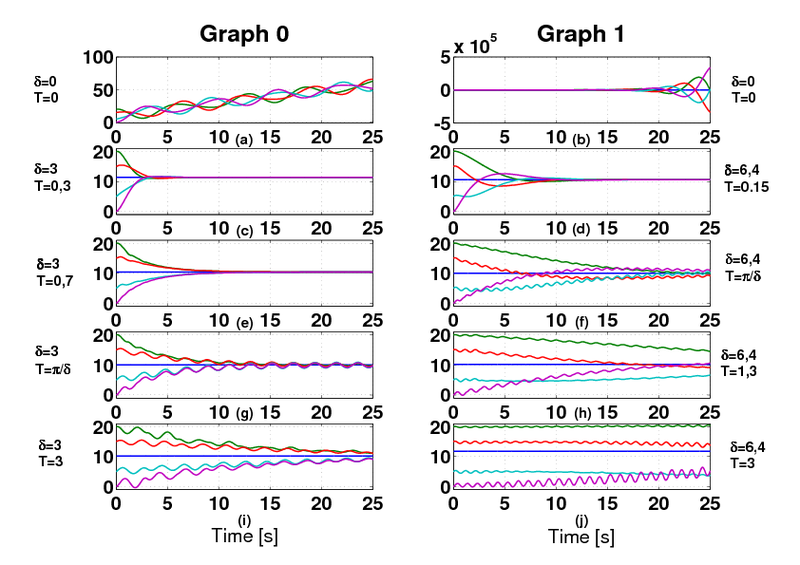 Figure 10 shows the examples of four communications graphs and Figure 11 shows the corresponding convergence rate. It can be seen that the convergence rate strongly depends on the connection. Note that an interesting phenomena concerning the full connected network is pointed out. It is now well known that for some systems, delays could improve the performance and even lead to stability  . It thus appears that a set of full connected agents is one of those systems. where and the sampling period T are parameters of the novel algorithm. The stability analysis is proposed for any graph, represented by the Laplacian L , under the assumption that there exists a directed spanning tree included in the communication graph. We propose a method, based on linear matrix inequalities, to choose in a proper manner, the parameters and T for a given L .
Figure 12 shows the main simulations results for different values of and T . One can see, if T = 0 , this algorithm is unstable for directed and undirected graph. Figure 12 (c-d) show simulation results using the optimal pair ( , T) according to our criteria, and the remaining figures show algorithm behavior for greater values of T . It's easy to conclude that for a too small or too important sampling period algorithm's performances decrease, and become unstable. The new algorithm offers several advantages, since it reduces information quantity needed for control or quantity of sensors needed, witch means economical, space and calculation savings. Participants : F. Garin [contact person] , R. Carli [Univ. di Padova] , G. Como [MIT] , P. Frasca [Polit. di Torino] . We study iterative distributed averaging algorithms for networks whose nodes can communicate through memoryless erasure broadcast channels. In order to compare the performance of different algorithms, we define suitable complexity measures, which account for the number of channel transmissions (communication complexity), and, respectively, of in-node computations (computational complexity) required to achieve a desired precision. These performance measures are particularly relevant, as they allow for directly estimating the energy consumption of such distributed computation systems, as well as their time-complexity. The algorithms we propose combine the classical iterative linear consensus algorithm (see Section 6.2.2 ) with coding schemes for the reliable transmission of real numbers on noisy channels, recently proposed in  . They involve a sequence of transmission phases, of increasing duration, in which the agents attempt to broadcast their state, i.e. their current estimate of the global average, to their neighbors, alternated to averaging steps, in which the agents' states are updated. These algorithms are fully distributed, and they do not require the agents to have any global knowledge of the network structure or size. Our main result shows that such algorithms drive the agents to state agreement (consensus) which can be made arbitrarily close to the true average. The number of channel transmissions and in-node computations is shown to grow at most poly-logarithmically in the desired precision. We also show how communication feedback, when available, allows one to modify the algorithms, achieving asymptotic average consensus (i.e., state agreement on the average of the initial observations), and reducing the computational and communication complexities. This work is presented in the paper  . Participants : A. Seuret, C. Canudas de Wit [contact person] , L. Briñón Arranz, B. Moore. An effort has been devoted to the problem of controlling a set of agents, cooperating under communication constraints. Formation control of multi-agent systems is also considered and we focus on the translation control and uniform distribution of the agents in a moving circle. 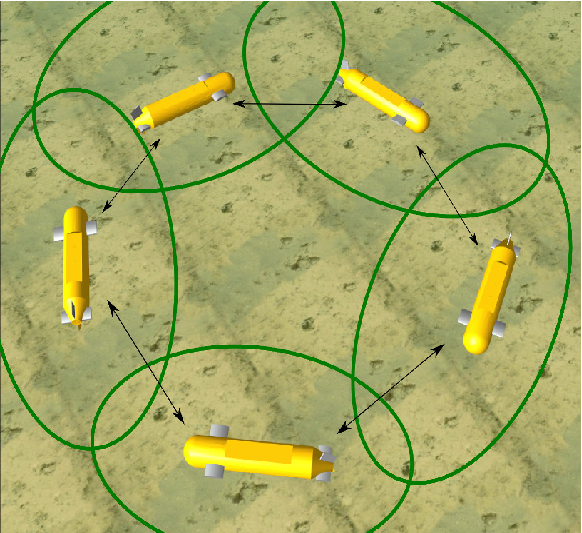 A version of decentralized formation control for multiple mobile agents was analyzed based on a concept of alignment error and the optimization thereof. This resulted in the development of a type of consensus algorithm for which the total alignment error of the formation is monotonically decreasing  . Current research is focused on source seeking behavior for a fleet of AUVs. One part focuses on centralized continuous time outer-loop control for steering a circular formation of AUVs and another on discrete time decentralized control with information delays. A first contribution in the context of source seeking problem consists in developing control laws to track time-varying formations of a fleet of AUVs (autonomous underwater vehicles). In  and  , we propose two control algorithms to stabilize the AUVs to a circular formation with a time-varying center and with a time-varying radius respectively. The problem of the uniform distribution of the agents along the formation is also considered taking into account the communication constraints. The objective now is to generalize this formation control approach in order to stabilize the agents to any time-varying formation including non circular formations. In  , a general framework for formation control is proposed. In this paper, the affine transformations (translation, rotation and scaling) are introduced to define the desired trajectories known for all the agents. A velocity tracking control law is developed and a consensus algorithm is included to achieve the same formation. Based on this first result, an elastic formation control law is proposed. An elastic formation is a time-varying formation result from the application of the affine transformations to the unit circle. We tackle the uniform distribution of the agents along the formation problem using a cooperative control which includes the Laplacian matrix of the communication graph. The future direction is to apply the gradient search algorithm from  to the elastic formation. We are working on a new collaborative source seeking control law based on  , in order to include the communication constraints.